To control the spread of the meningococcal serogroup B disease in the Saguenay–Lac-Saint-Jean region which has had a higher incidence rate compared with the rest of the province since 2004, a vaccination campaign was undertaken and targeted individuals 20 years and younger residing in or attending an educational institution in this region. An enhanced surveillance system was implemented to monitor the onset of adverse events following immunization (AEFI) in real time in order to be able to promptly notify the Ministère de la Santé et des Services sociaux (MSSS, Ministry of Health and Social Services) and the Direction de la santé publique (DSP, public health unit) of the Saguenay–Lac-Saint-Jean Health Region (RSS 02) about the occurrence of a safety issue in connection with this new quadrivalent serogroup B Meningococcal vaccine (4CMenB). This report covers the experiences of individuals residing in region 02 who received their first dose of 4CMenB between May 5 and June 17, 2014. Both active surveillance and passive surveillance were used to track the occurrence of AEFIs. 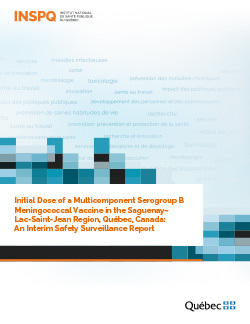 Active surveillance was performed via electronic questionnaire sent to all vaccinees who provided an email address, whereas passive surveillance was done via the reporting to the AEFI surveillance system already in place in Québec and known as the ESPRI surveillance. For active surveillance, all vaccinees who had provided their email address on the vaccination consent form received an email seven days post-vaccination inviting them to complete an electronic questionnaire. Between May 5 and June 17, 2014, a total of 43,740 individuals between the age of 2 months and 20 years residing in RSS 02 received a first dose of the 4CMenB vaccine. Of this number, 29,853 (68%) provided an email address and 12,332 (28% of all vaccinees, 44% of those who had a valid email address and received the questionnaire) completed the electronic questionnaire by July 2, 2014. Of these, nine percent (9%) reported the onset of fever within 48 hours following vaccination and 1.9% reported fever within 3 to 7 days. The incidence of fever was higher in children under the age of 2 years (14–15%) than in children between 2 to 4 years old (12%) and those 5 years of age or older (6–8%). In children under the age of 2 years, antipyretic prophylaxis reduced the probability of fever in the first 48 hours by approximately 50% compared with children who were not given these drugs. Overall, 6% of respondents experienced a health problem within seven days postvaccination that resulted in absenteeism of the person vaccinated or a parent and 1.2% consulted a physician. The most frequently reported problems were general malaise (56%), local reactions (49%), gastrointestinal problems (34%) and respiratory problems (24%). A single case of febrile convulsion was identified and no vaccine-related hospitalizations were reported. The estimated rates of absenteeism attributable to local reactions, fever or general malaise with onset within 48 hours postvaccination were 3.1% for children between the ages of 2 and 4 years and 4.4% for those between the ages of 5 and 16 years. Open-ended comments were provided by 20% of respondents, of whom 83% reported pain at the injection site. Of the 12,332 individuals who completed the questionnaire, 99% stated that they likely or definitely intended to receive the second dose of the vaccine, whereas this dropped to 92% in the 764 individuals who reported absenteeism or a medical consultation. Under the passive surveillance reporting system, 56 cases of AEFI were reported through the ESPRI surveillance: 46% were an allergic-like event, 29% fever and 19% a large local reaction. One case of febrile seizure was reported. This surveillance did not identify any serious or unexpected health problems associated with the vaccine. It did, however, confirm a significant incidence of painful local reactions, fever and general malaise that caused absenteeism.